PLEASE NOTE the hairs of some caterpillars can cause skin irritation so care should be taken to avoid direct skin contact. 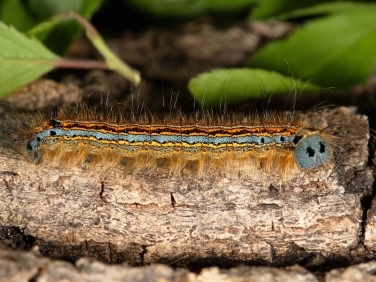 As previously reported the hairs of Brown Tail caterpillars are particularly prone to causing quite a severe skin reaction. Although most caterpillars have hairs, known as setae, they are often almost invisible to the naked eye, being pale and thinly spread. Below are some of the most commonly seen hairy caterpillars. Other less frequently seen hairy species and those with extraordinary tufts can be seen in the Moth Caterpillar Galleries. 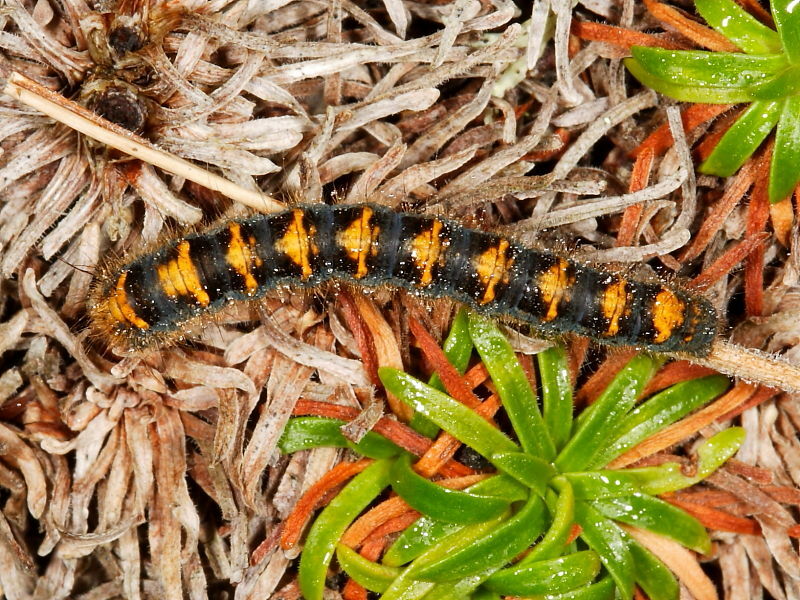 There are no densely hairy butterfly caterpillars in the British Isles but several very ‘spiky’ species are shown in the Butterfly Caterpillar Galleries. When using the caterpillar galleries it’s worth bearing in mind that some caterpillars dramatically change their appearance as they grow. With each skin moult they can suddenly look very different. Consequently young caterpillars may be take on a totally different appearance when fully grown. 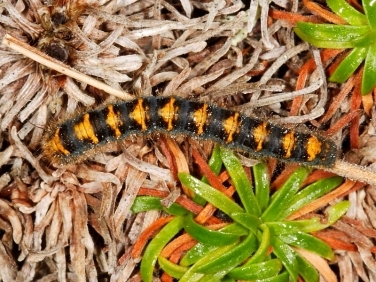 As an example the image left is of an early instar (young) Oak Eggar moth caterpillar followed by two progressively later instars. 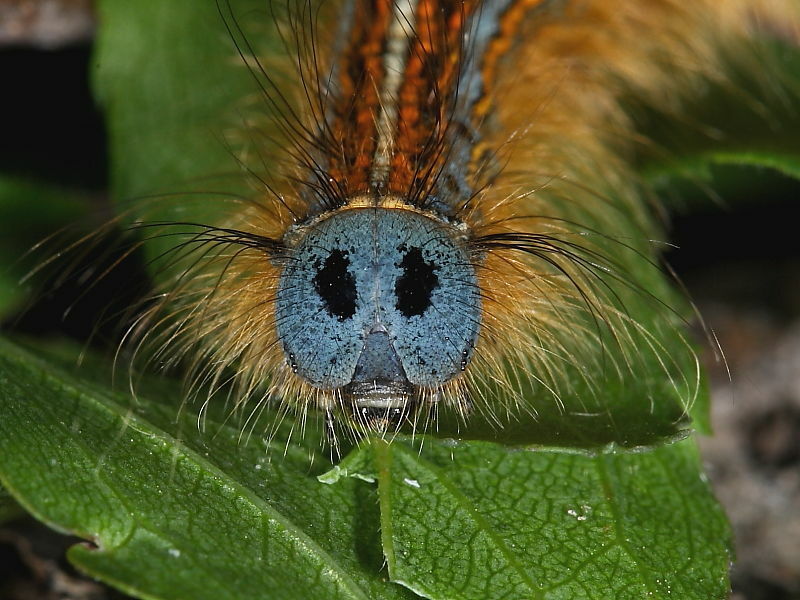 As part of a caterpillar’s survival strategy the dense hairs offer some protection from predators enabling them to safely sit out in the open during the day. 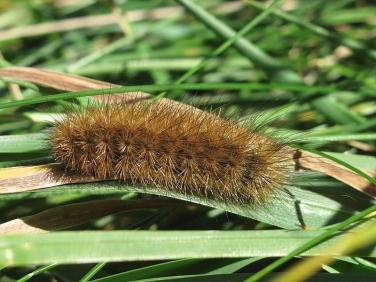 Many species are most commonly seen when fully grown and walking across open ground looking for somewhere to pupate. 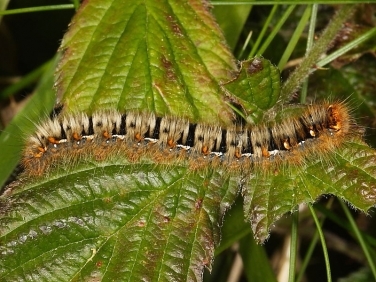 Below, starting with the fully grown Oak Eggar caterpillar, are some of the other densely hairy caterpillars often seen in the British Isles. These photographs are all of fully grown caterpillars. The Oak Eggar caterpillar grows to about 75mm and is commonly found in many parts of the British Isles. It is commonest on open heath and moorland and not associated with oak trees as its name would suggest. By late spring it is fully grown and can often be found lying on top of low vegetation. 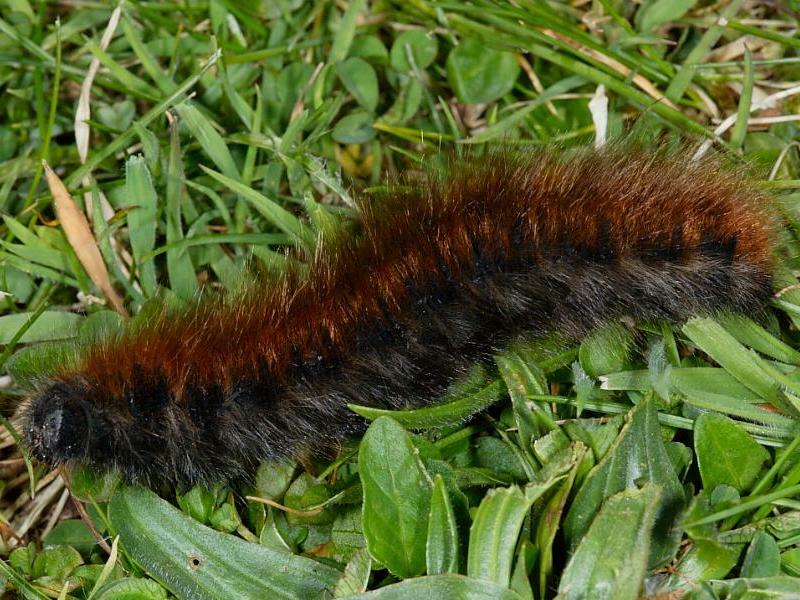 In the colder north the caterpillar adopts a two year cycle. 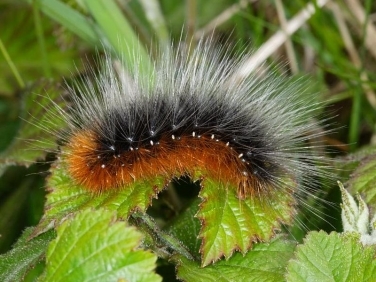 The Fox moth caterpillar grows to about 65mm and is commonly found around the coast and in open country throughout much of the British Isles. When fully grown it is often found in late spring basking on top of vegetation and on the bare soil of well worn paths. This is another species where the early instar caterpillars look very different to the fully grown caterpillar. 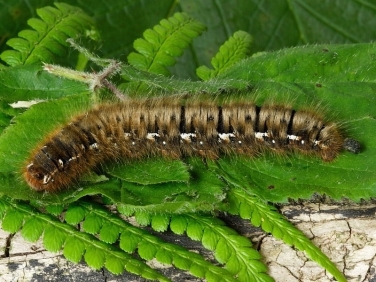 The Lackey caterpillar grows to 55 mm and is fairly common throughout most southern counties of the British Isles. It is not the hairiest of caterpillars but has a band of thick ginger setae extending down its side. When small it lives communally in a spun web that can be found in a variety of deciduous hedging and trees. It is particularly frequent in coastal Blackthorn hedges. More information on The Drinker Moth caterpillar grows to about 65mm and may be found throughout most of the UK in open grassy habitat but is most common in the south. It can often be found during the day amongst grasses and reed stems. It is fully grown by May/June and may sometimes be found basking in the sun on stone walls and wooden posts. The Garden Tiger Moth caterpillar grows to about 55mm long and is often referred to as the ‘Woolly Bear’ caterpillar because of its long hairs. It is common throughout most of the British Isles including urban gardens although its numbers seem to have declined sharply in recent years. 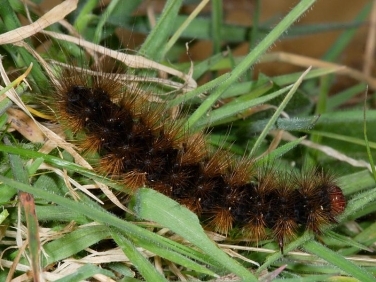 The Garden Tiger is also found in North America and in many states where it’s known as The Great Tiger Moth and one of several Arctiidae caterpillars called Woolly Bear caterpillars. 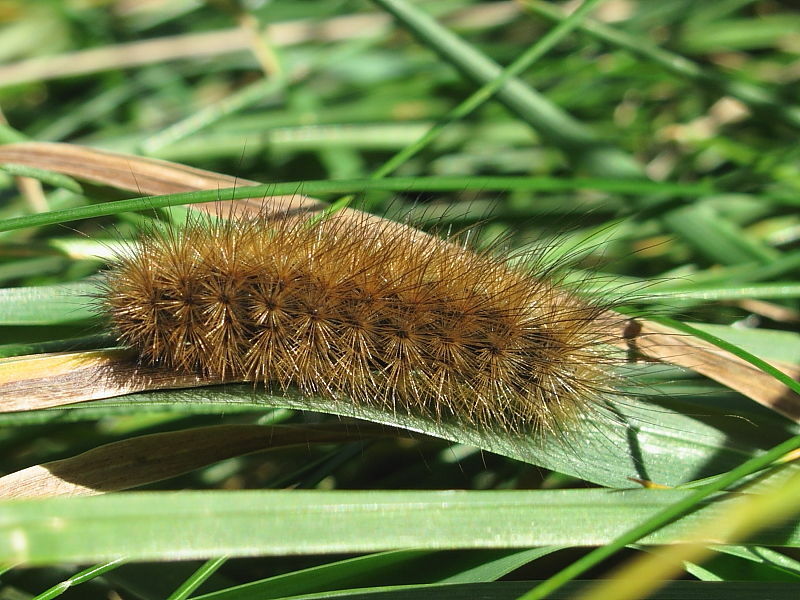 The Cream-spot Tiger moth caterpillar grows to about 65mm and is fairly common in open habitat in southern parts of the British Isles. When fully grown in the early spring it may be found basking in the sun on grasses and herbaceous plants during the day. 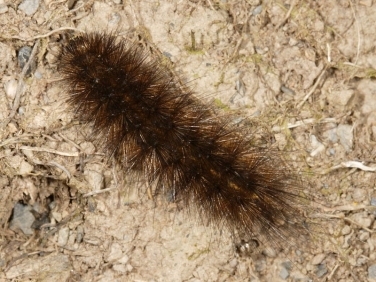 The brown head helps identify it from other hairy caterpillars. 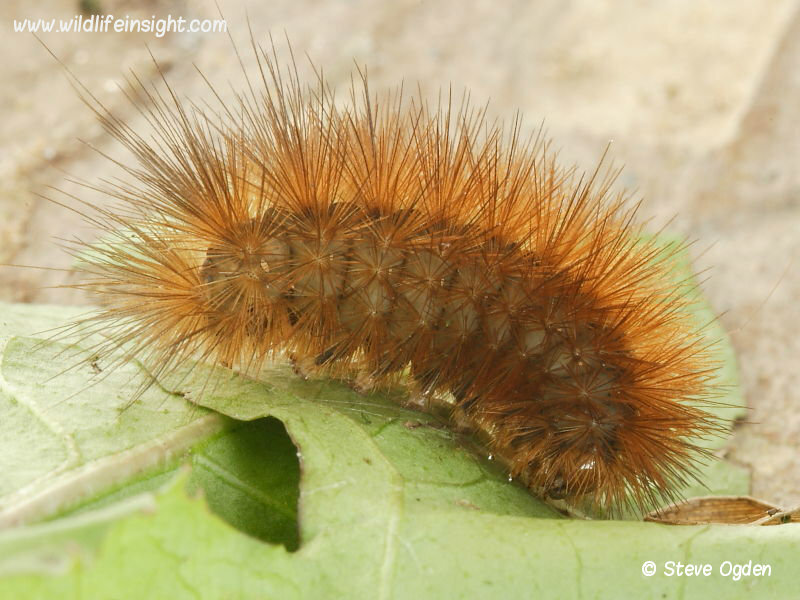 The Ruby Tiger moth caterpillar grows to about 35mm and has a fairly wide distribution throughout most of the British Isles but is more common in the south where there are two broods. The Ruby Tiger is also found in parts of North America. When looked at closely the hairs are light brown and sprout in tufts. It can often be seen basking in the sun on low vegetation during the autumn and spring. The White Ermine moth caterpillar grows to about 45mm and is widely distributed throughout much of the British Isles. It feeds on a variety of herbaceous plants and can sometimes be seen walking quickly across the ground looking for somewhere to pupate. Looked at closely the hairs are not as dense as on some hairy caterpillars. An orangey thin line runs down its back but this is not always easy to make out amidst the hairs. 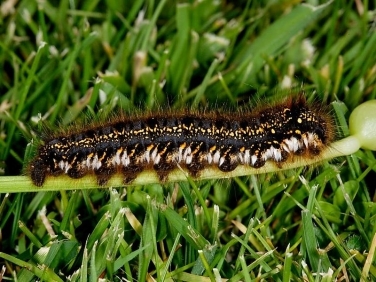 The Buff Ermine moth caterpillar grows to about 45mm and is a common species found throughout most of the British Isles in a wide range of habitats. The brown hairs can appear quite gingery in sunlight and the pale dorsal line extending down its back is not always clear to see through the setae. A broader, pale band running down its side is more obvious, particularly if it rolls up on its side. 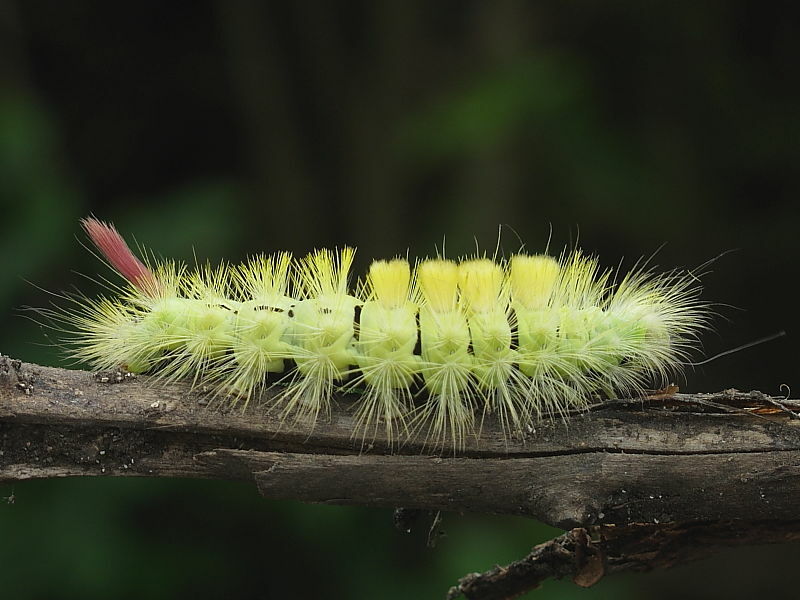 The Pale Tussock moth caterpillar grows to about 45mm and is fairly common in the southern half of the British Isles. The caterpillar feeds on a wide variety of deciduous trees. The fully grown caterpillar can be various shades of green and yellow, with some caterpillars lacking the distinctive red hair tail spur. Is the tail spur dangerous? Most often recorded in September and October when it may be found walking on the ground looking for somewhere to pupate. 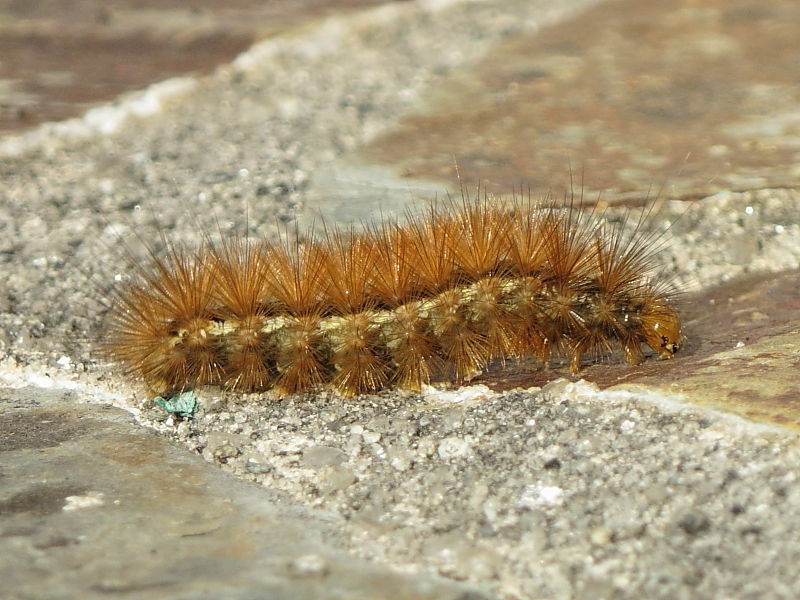 Information on the Sycamore moth caterpillar. More hairy caterpillars can be seen in the Moth Caterpillar Galleries, Butterfly Caterpillar Galleries and American Caterpillar Gallery. Also included are the largest Hawk-moth caterpillars and many that are brightly coloured, cryptically camouflaged and extraordinarily shaped.